Skilled editors can help authors transform an ordinary manuscript idea into an extraordinary book. 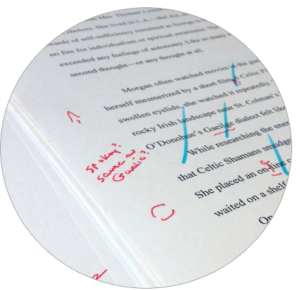 Professional editing can help your book rise above other self-published books, not to mention make it marketable. Nothing shouts non-professional self-publisher (aka DIY) louder than a poorly edited manuscript and marketing materials. Developmental editors help you develop your project from an initial concept or draft, and can consult with you before the writing even begins. Developmental editors can help plan the organization and features of your project. They may make suggestions about content and presentation, write or rewrite text, do research, and suggest additional topics for you to consider. Substantive editors work with you once you have a full text. They will help you get it into its final form, which may involve reordering or rewriting segments of it to improve readability, clarity, or accuracy. If you’re a fiction writer, a substantive editor can alert you to inconsistent character behavior or speech, help you adjust your language to your desired audience, and make sure your story has believable dialogue and a plausible plotline. Copy Editors work with your text when it is in final or nearly final form. They read each sentence carefully, seeking to fix all errors of spelling, punctuation, capitalization, grammar, and word usage while preserving your meaning and voice. With your permission, they may rewrite tangled sentences or suggest alternative wordings. They can ensure that your text conforms to a certain style; if your project includes elements such as captions, tables, or footnotes, they can check those against the text. Proofreading is the final stage in the editorial process. Proofreaders usually see a project after design is complete and any photos or other visual elements have been placed. They correct errors overlooked during copy editing or introduced during the design process. If you wish, they can also cross-check the text to ensure that earlier changes were made correctly, and they can check design elements such as heading and typeface styles, page numbers, and the like.